We finally had a chance to see around Berlin this time. 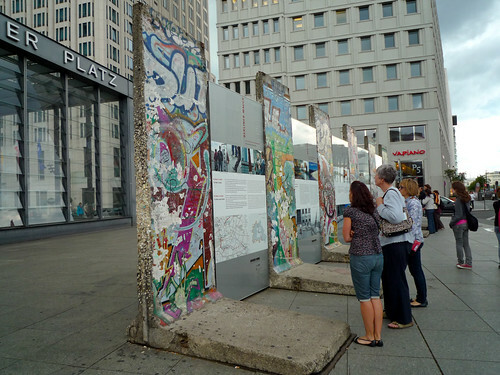 The Berlin Wall, which I wanted to see the most, was destroyed 20 years ago, but we can still see some of it there. 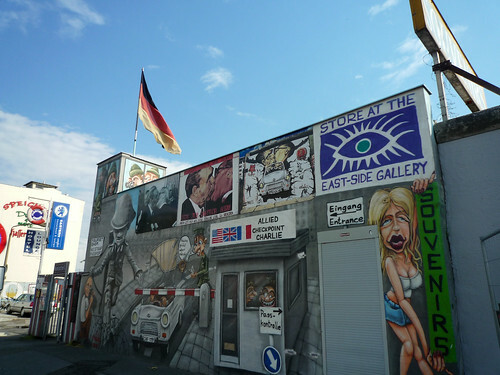 It was so interesting to find out the atmosphere in the east side of Berlin and the west side was quite different. I felt uncomfortable, even scared to walk around the east area. Panda told me that there is a big economic gap between the east and the west. That’s the reason the east side looks more empty and poorer. 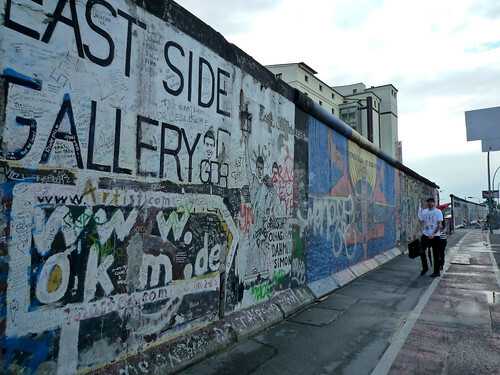 We first visit to the East Side Gallery – a 1.3km long section of the wall. 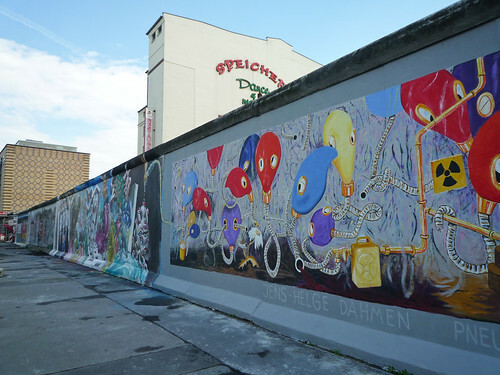 The wall here was painted by artists from all over the world (Photo 1-3). 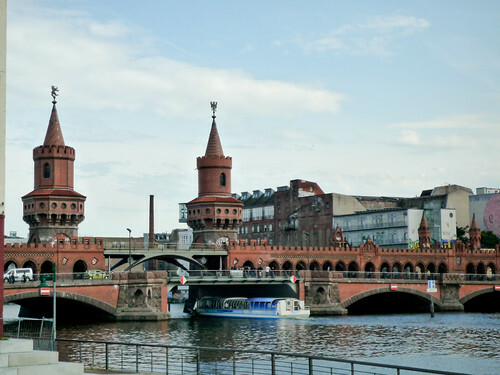 The next photo is of Oberbaumbrücke bridge, you can see from the East Side Gallery. If you have watched the movie “RUN LOLA RUN”, this is the bridge the main character Lola run through. I like the movie, it was taken using quite unique techniques. Next, we went to the Potsdam Square. 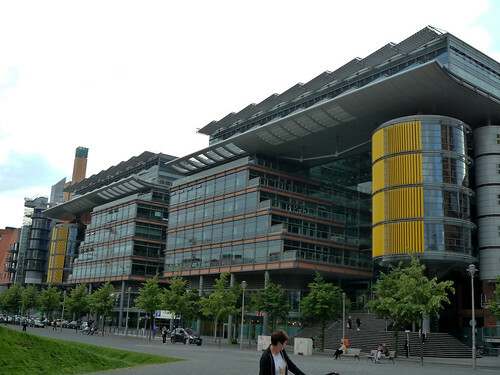 This area has been developed rapidly after the wall down, so there are so many futuristic buildings (photo 5). Some remains of the wall looks so small in the building jungle (photo6, 7). 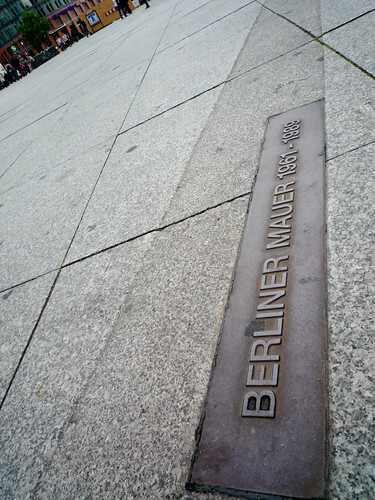 There are markers on the street telling us where the wall was before (photo 8). Five minutes walk from the Potsdam Square, the Memorial to the Murdered Jews of Europe suddenly appears out of the street (photo 9). 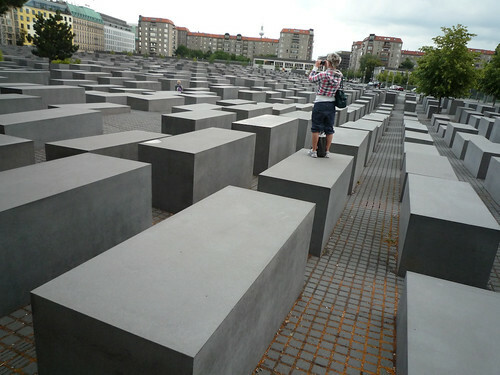 This is a memorial in Berlin to the Jewish victims of the Holocaust, designed by architect Peter Eisenman. The site is covered with 2,711 concrete slabs or “stelae”, arranged in a grid pattern. This is something to see. 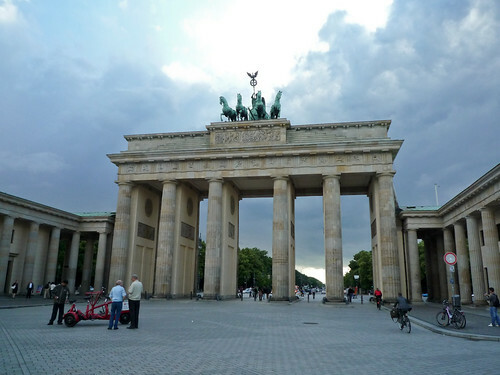 Our last destination was the Brandenburg Gate – symbol of Berlin (photo 10). Atop the gate is the Quadriga, a chariot drawn by four horses driven by the goddess Victoria. 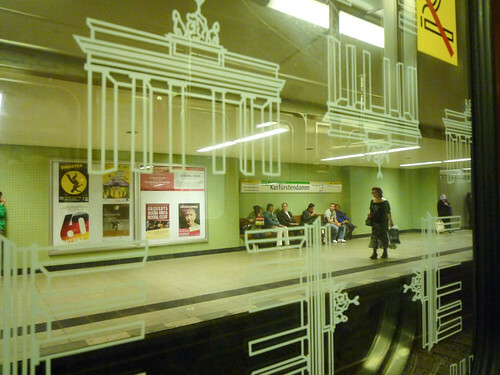 You can find the gate even as the window motif in the subway (photo 11). By the way, one of our cameras was broken on the trip… so sad. All photos on the entry were taken by the compact camera, not the digital SLR camera. Hope it will be fixed. 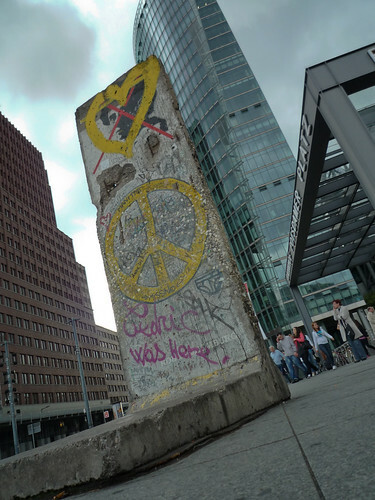 This entry was posted on Sunday, June 28th, 2009 at 6:32	and is filed under Berlin, Travel and Trips. You can follow any responses to this entry through the RSS 2.0 feed. You can leave a response, or trackback from your own site.